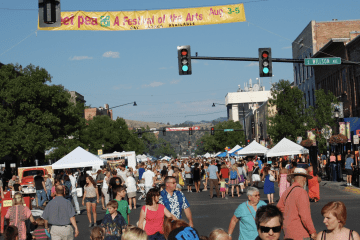 Always the Wednesday preceding the weekend festival from 5:30-8:30pm on historic Main Street in Downtown Bozeman. Enjoy the food and drink offerings of over 40 area restaurants and food vendors. There are bands and entertainment on every corner, food choices galore, and the fun of dining among friends in the middle of Main Street. Visit www.sweetpeafestival.org events for more information.